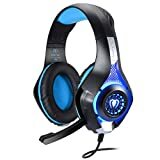 【Widely Compatible and Versatile 】This 2016 latest gaming headset is mainly designed for PS4 gamers, but you can also use it on Smart Phone / PC / iMac / Laptop / Tablet / PSP / New Xbox one. 【High Precision Magnetic Driver】Awesome surround sound, makes you feel like you're right in the middle of your games. 【Comfortable and Light Weight】 The headset has padding on the top and around the ears, which makes this a suitable option for long hours of play but doesn't feel heavy on. 【Long Soft Braided Cord】 Over 7 feet! Which for a video gamer this is perfect, no need to sit right in front of the TV. Having such a long cord allows for much more movement and be comfortably. 【Smooth Mic and Volume Control 】There is a small controller on the cord, allowing you to turn the mic on and off, and the volume up and down with ease.